WARNING: There could be spoilers in here. I don’t give away key plot points, but do allude to elements that some may consider “spoilers”. Read at your own risk. I saw Brave on Thursday. My expectations were high. A movie coming from the company that has created such landmark animated achievements as the Toy Story trilogy, Monsters, Inc., and Finding Nemo definitely has a pedigree weighted heavily for excellence. I was not disappointed. This is the kind of princess movie I have waited to see for a very long time. The film was not as obviously imaginative as some of Pixar’s preceding films. Its cast are normal people with normal animals who live (for the region and time they are in) normal lives. The animated feature staple of anthropomorphism or personification is mostly non-present. Because of this void, Brave does not immediately make us say: “My goodness! How clever! A talking dog!”, but roots its narrative in a more concrete reality and stretches creativity in a different direction. 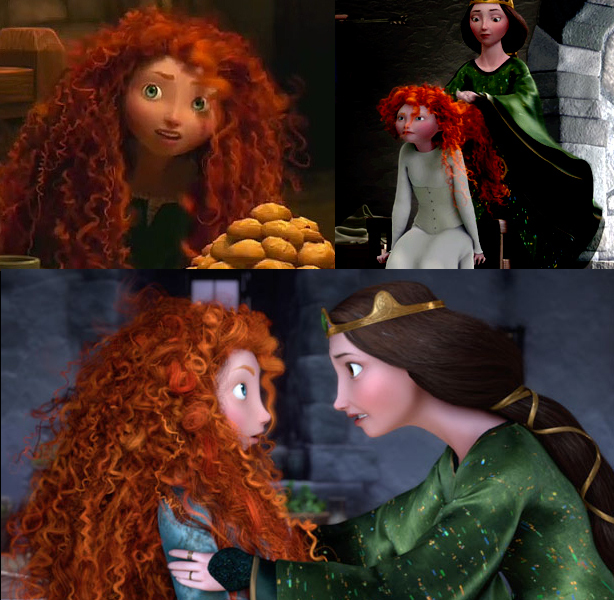 Up until Brave, the Pixar lineage was completely magic free. Any cute talking animals or personified thing were a direct result of scientific achievement or because the alternate world in which the story took place. In this film, Pixar embraces a Disney tradition as old (or older) as (than) their first full length animated feature film while mixing in their own flair for whimsy and fun. The use of magical power, however, is tasteful. It doesn’t solve a problem as much as it introduces a potential solution. There are no glass slippers or fast talking genies. There is not even a wise shaman monkey. Magic isn’t something that solves problems, it is something that opens an avenue for healing. The animation, of course, is jaw dropping. I will let other people more adept in the CGI terminology talk about the complexity of that hair (holy gosh – that HAIR), but it is a visually striking film. The technical merits of this can’t be ignored, but they weren’t what impressed me the most about this film. 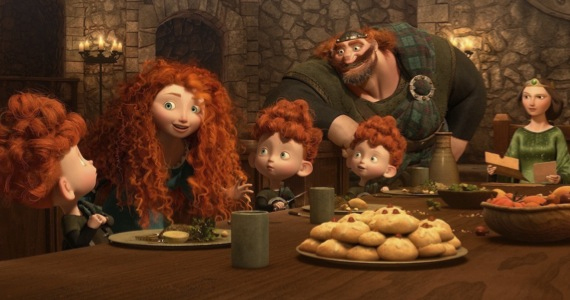 Brave is a different kind of Pixar film, but it is also a different kind of princess movie. The thing that blew me away the most was that this was a princess movie that didn’t end up with a kiss from a prince at the end and it wasn’t even the slightest bit disappointing. I am not going to get all girl power on you. I am not going to enumerate the flaws of the other Disney/Pixar/DreamWorks/Etc. “tough, smart, and independent” princesses. I am not going to tell you that men are evil and marriage is a trap devised to keep women in check. That is not what this review is about and it isn’t what the film was about. The film was about a different kind of relationship than that between a girl and boy. It was the love story between a mother and a daughter. Being 16 (as is the heroine in this story) is ridiculous. Even if you are not a ginger princess bound by a tradition you don’t like, it can be tricky, especially when your mother gets involved. There is a formative moment in a young woman’s life, however, where she learns that asserting her own independence and identity does not mean alienating her roots, but accepting them on her own terms. That is what this movie is about. It is about struggling against rules and societal bonds. It is about finding your own path. It is about making mistakes and being accountable for the decisions you made. It is about giving up selfish ambition. It is about humbling yourself enough to beg forgiveness, not because you have to, but because you want to. It is about healing broken bonds. Family. It is never perfect. 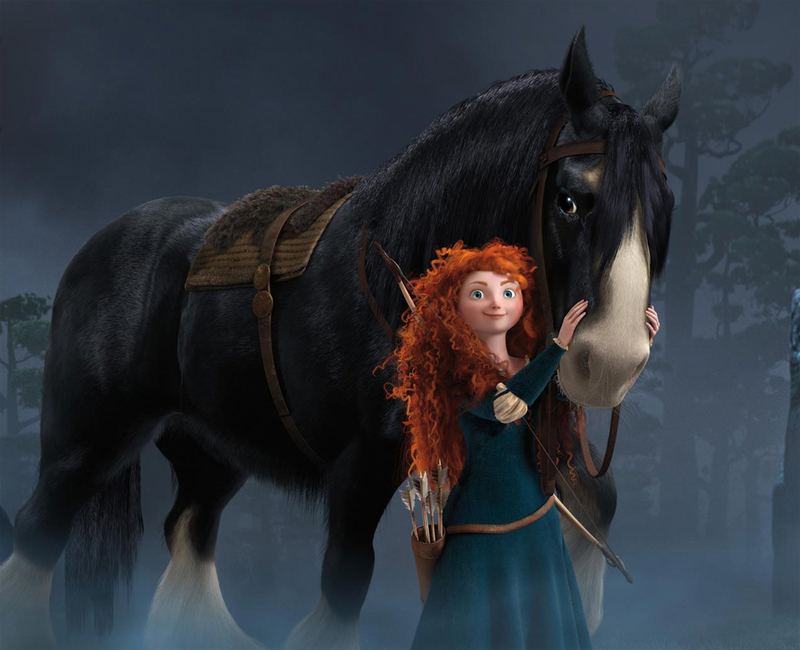 Brave is probably not going to break box office records. That does not, however, make it less poignant of a piece. It is probably not going to be remembered as one of Pixar’s greatest films. It lacks some of the commercial cuteness of some of its counterparts (but it makes up for it in bagpipes and haggis). It does, regardless, accomplish exactly what the best of all the other great Pixar movies have (even if it is in a less obvious sense). It makes us glad for what we have and gives us the courage to love. I would love to see “Fifty Shades of Grey” try to do that. 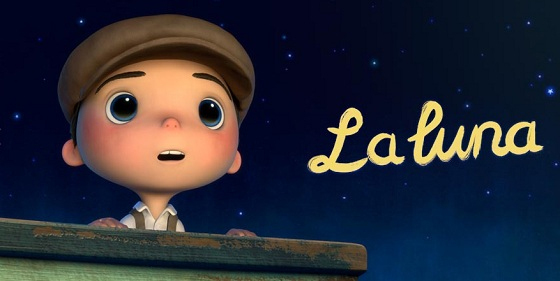 BONUS: the short before Brave is one of the most charming pieces of animation I have seen in ages.